“The Night Shipment of Tears has arrived. We need to sort them first, according to the sender’s name, and then secondly by the fragrance of the prayer or tears. Make sure each golden bottle is properly sealed and labeled. They must be preserved and readily available for the 24 Elders when they bow before the Throne. “Then, on this Leger here, I want you to enter today’s date, the sender’s name, and also the subject of their prayer, so we can sort these vials according to their specific odors. “The tears and the prayers of the saints have been captured on earth by our Angels and sealed into golden vials. They are Earth’s most prized possessions. There is nothing that the Lord counts more valuable than these. 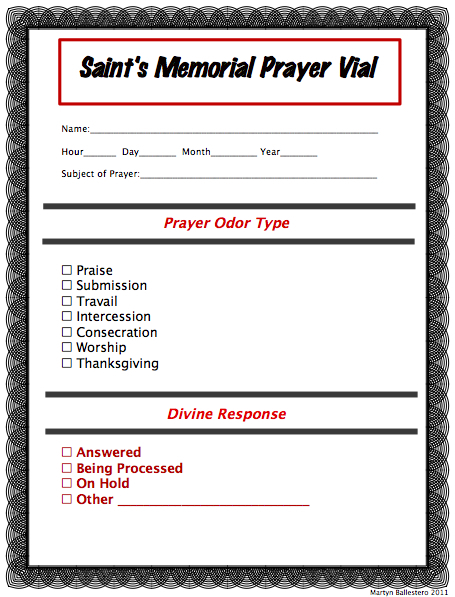 “The tears of each prayer type have odors that only He can discern. It is the only earthly thing allowed to enter into this, the Holiest of all places. Michael the Archangel looked around at his fellow Angels. They all nodded their acceptance of the requests and turned to busy themselves. The vials were then stored in a large room of innumerable vessels holding the tears and the prayers of the saints. Their odors were a sweet-smelling fragrance that could only be enjoyed by the King of Kings. Psa. 56:8… put thou my tears into thy bottle: are they not in thy book?